I am trying to adjust the focus on an IR converted *ist DS with a Pentax 16-50mm 2.8 zoom. My understanding of IR is that you need to focus nearer than the subject with visible light than IR. So if I set the distance on the lens to 7 feet, IR will focus behind 10 feet. This is based on manual focus lenses with IR marks. With the Pentax, if I focus at infinity, things that are about 8 feet away are in focus, meaning that the IR focus is in front of the visible light point. If I adjust the autofocus point to about -390nm, the lens then focuses nicely for near subjects, but can not focus at a distance. The attached image shows the problem. Is this an oddity of the Pentax 16-50mm, or am I missing something? Around a couple weeks ago when I first tried IR, I was keeping the cam on manual focus, but found the pictures very soft. I've since been told that autofocus works and now I just guess where I want the focal point to be and adjust where the spot focus is within the frame. Sorry if this is something you already knew... I know that my response does not directly relate to your query. Perhaps there is a reliable way to manually focus w/ an IR filter... if there is, I'd like to know too. Don't know if this would work but you could try using autofocus on a tripod and then adjust the diopter to bring it into focus. Then maybe you can focus more accurately in manual. Please don't flame me, it's just a thought. I should have explained, the picture attached was taken at 16mm, f2.8, manually focused at infinity with a fast enough shutter speed to avoid any risk of shake. For IR you are best off focusing in manual mode. Stop down your aperture too. At different times of the day there is different amounts of IR light. You cannot see this light, so an auto focus sensor and your eyes can only see the visible spectrum of light. An auto focus camera will not focus properly with IR filters. effective ISO drops too. For Rollei IR film the ISO drops from 400 to 3 with an R72 filter. For digital you might need to adjust your exposure index to compensate for the loss of light through an IR filter. Different IR filters use and block different amounts of light in the spectrum, so results can vary there too. Hi, I started to test with ir last week. I got something reasonable second time around. From what I hear small aperture and a tripod is a must. The image is reasonably sharp but you can see the branches swinging due to long exposure. Last edited by Nico; 06-13-2009 at 01:50 AM. From what I can see on my old manual lenses with infra-red index mark, once the camera has focused, you need to focus nearer by what amounts to 1 f-stop. If you find a depth of field scale, yoou could use it to adjust focus. Just my two pennies. The problem is not lack of depth of field, but incorrect focusing. As you say, for IR you should focus *nearer* on the distance scale, because IR focuses further back. What I am seeing is the converted camera is focusing too near, and even with the lens set at infinity, only close subjects are in focus. When it gets bright and sunny, I will try the lens on my unconverted K20D with a 720nm filter to compare results at different focusing points. Taking IR photos w/ a converted camera is different from doing so w/ a normal camera w/ IR filter mounted in front. The AF would be wrong (mostly) if you use the camera's AF to take photos. But luckily for most Pentax dSLR cameras, we can do AF adjustment in debug mode. Which means after proper AF adjustment, you'd be able to take sharp IR photos w/ AF by the camera instead of using manual focus. The AF ajustment value isn't fixed, it depends on the lens used, the filter installed, and the camera too. Some lenses don't work well for taking IR photos, and the DA1650 happens to be one of them. The best zoom lens I've ever used for IR photos is the DA18-55 kit lens (version I or II, the second version is even better), the best prime lens for IR photos is the DA21. It's not like you can use every lens for IR photos, even w/ a converted camera. Sometimes you think it's the camera's problem, but most likely it's the lens. And to be honest, when taking a wide scene at 16mm w/ F2.8 and wide open aperture, I'd be very surprised if you can see a sharp result at 100% level. Better stop it down to F8 and see how. 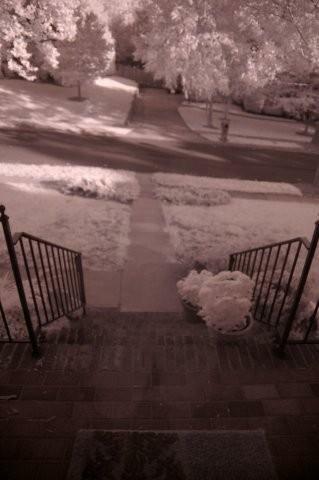 Again, the DA1650 isn't really a good lens for IR photos, at least not on a converted camera.